Cleveland Public Library - The Rogers Co. The Rogers Company worked with design firm Nesnadny + Schwartz to bring the “Changing Minds” exhibit to the public with a display that was designed to travel throughout the Cleveland Public Library system. 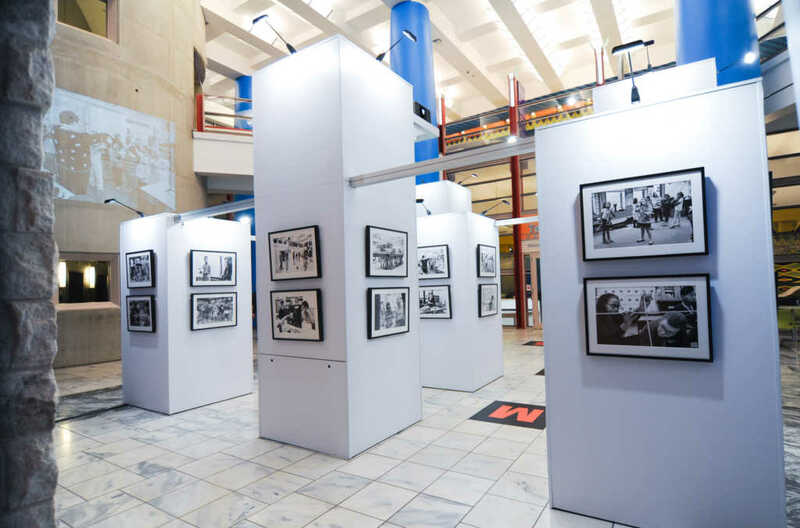 The exhibit captured photographic moments of passion, concentration, and celebration from teachers, parents, and students that make up the Cleveland Metropolitan School System. The title “Changing Minds” reflects how public schools in Cleveland are dispelling myths, breaking down barriers, and re-picturing education. The project was commissioned by The George Gund Foundation. The exhibit consisted of eight large towers that were constructed of lightweight aluminum extrusion frames with laminated panels. The towers ranged from 8’ tall up to 12’ tall. Two of the towers were internally lit with LED lights and backlit printed silicone-edged fabric graphics. The tops of the towers were translucent white acrylic with silhouette cut letters. 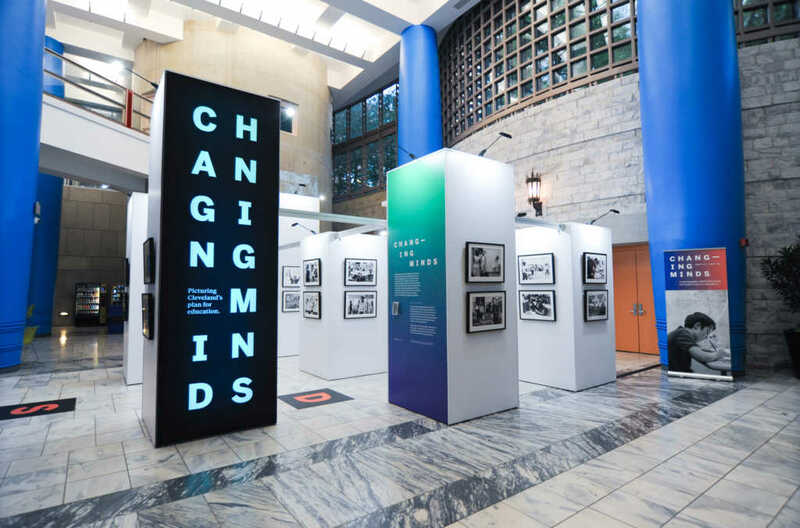 The LED lights within the tops and behind the fabric graphics scrolled through a range of colors, supporting the idea of “Changing.” Additional floor cling graphics completed the “Changing Minds” message. 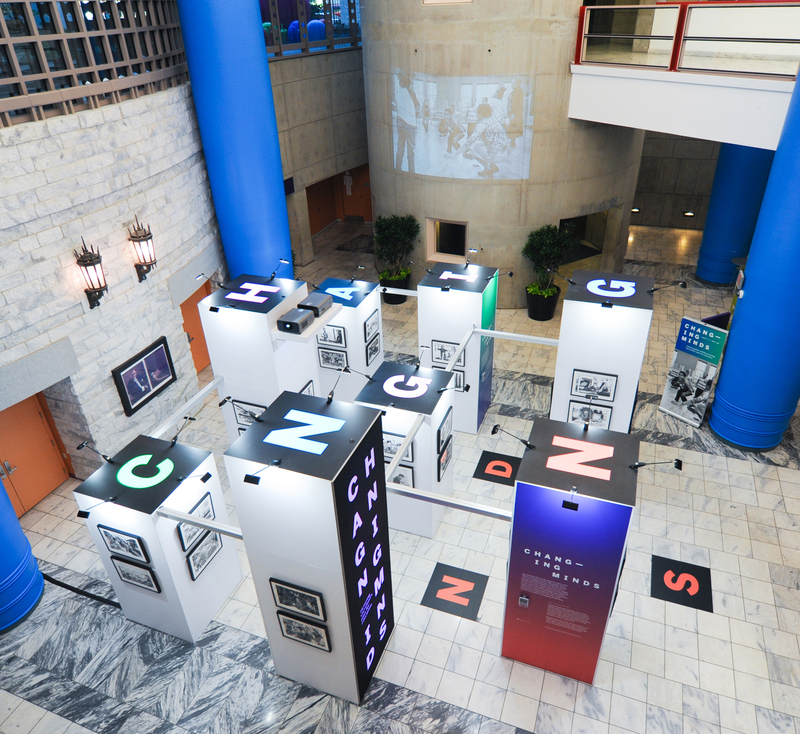 Within the library space, there were two large 20’ diameter by 40’ high unfinished concrete enclosures that created a perfect canvas to showcase all of the photographs via projection. Two projectors were integrated into one of the 12’ towers. Visitors could view the projected images on all levels of the library. To supply power to the towers and projectors, we created an enclosed aluminum bridge that connected to each of the towers, to free the cords from creating a tripping hazard. The exhibit was crafted, constructed, and assembled in Rogers’ design and fabrication facility. The entire exhibit was disassembled, transported, and reassembled on site. Installation required two days, with most of the assembly happening on day one, and artwork installation and AV adjustments happening on day two.